Fei and Johnny are two rookie cops, raised in single-parent families. They are constantly bickering and can’t stand the presence of each other. Not only are they loggerheads at work, their lives further intertwined when each of their parent fell crazily in love and got married! Soon, the “brothers” are assigned to investigate a murder case that leads them to a big conspiracy, where hilarious happenings await. I’ve missed the premiere for this film as I was in Bangkok, hence decided to catch it with my friend when I’m back. Knowing that it is a Hong Kong comedy, I had set low expectation for the film, watching the film just to support Bosco Wong. In many ways, this film surprised me with their characters. With two completely opposite personalities, rash versus timid, flirtatious versus reserved, Fei (Bosco) and Johnny (King Kong) were the most unmatched buddy-cop pair possible, which created absurd chemistry of course. While Bosco was an unpopular person (for once), King Kong surprised me with his new mummy boy character. Different from his past gangster and crude outlook, he was so soft-spoken that I couldn’t help but be impressed. Getting an ugly look seems to be a stage every pretty actress have to go through at some point of time, Kate Tsui’s petite princess wasn’t THAT ugly enough to be turning off everyone. While I would have to ask her to work more on making her role more ugly, I like her positive outlook to her demise. That’s definitely something many people can learn from! Charmaine Tsui as Fei’s psychotic ex was good in her own (terrorizing) way, but I simply don’t see why Fei would be attracted to such a person from the start. Do you mean a one-night stand is enough to rope him into a relationship? While she was possessive and weird, both of them had little chemistry as a couple. This movie produced by Eric Tsang was completed in 2012 and is only released recently in 2016. Kate Tsui was 2004’s Miss Hong Kong champion and this was her first time taking up an “ugly” buck-tooth and unfashionable role. During the credits, Bosco appeared wearing long hair wigs and acting as Japanese AV girls. According to him, there were many outfits, such as nurse, air-stewardess, female police etc. Check out Buddy Cops (刑警兄弟) Facebook Page! 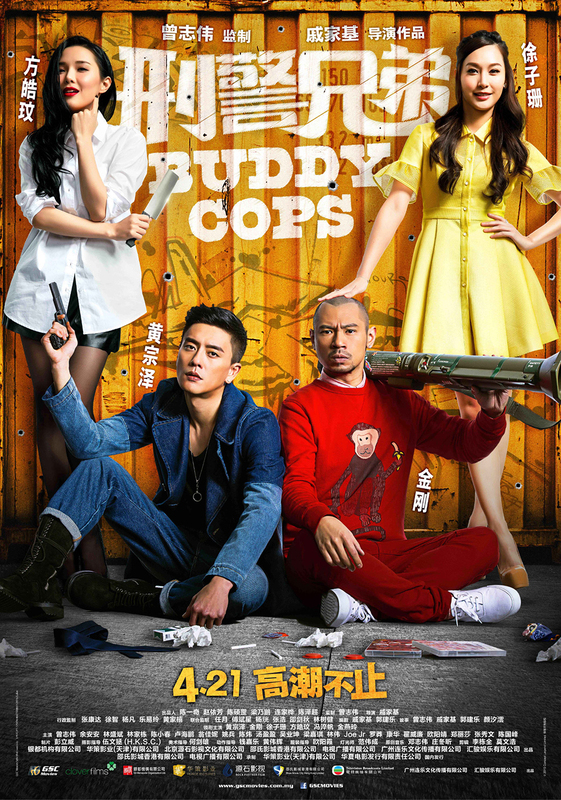 Buddy Cops (刑警兄弟) is out in cinemas on 21 April 2016. I might watch it because of Bosco Wong, I like most of his movies. Looks like a light-hearted movie, good to watch when you want to chill and be amused by the funny storyline. Thanks for sharing! Not familiar with the cast of this movie, but it looks fun. I’m a sucker for action-comedy films rather than chick flicks. I hope they dub it in English though, not sure if I can get to see it here in Manila anytime soon. Looks like an ebullient movie. Would love to watch it. Must be a fun watch. The guys look cool. Will let my hubby know who loves mandarin movies. I am not familiar of the actors but it seems interesting. I like watching comedy films, so I guess I should try this. Sounds like a fun and entertaining movie. Great review and you’ve got great pictures too. Reminds me of the American movie “Bad Boys” starring Will Smith and Martin Lawrence. I saw a preview of Buddy Cops on Youtube and it really looks like a fun movie. Based on the photos you posted, I do not think I will like this type of film. Odd that even there is a good number of Chinese in our population, they do not show Chinese films in theaters anymore like before. sounds like a typical HK cop-comedy kind of movie? sad to say the cast and plot doesn’t entice me at all. will definitely be giving this movie a miss. It seems like a fun movie but have not heard about the actors in this movie. Hopefully we all can go for it. I really enjoy this type of movie. I love action comedy films. Plus HK film studios are really good making these kind of films. I’ve always been a fan of love-and-hate action comedies concerning friends and would-be brothers. This looks like an excellent flick! Thanks for posting a preview as well. The characters seems to be animated in terms of the look and personality. It looks like a really fun movie. Sounds like an ok movie. I’ve never heard of any of the actors before now though, but I love buddy cop type movies, so would love to see this if it is dubbed in English.